This set of Electrical Machines Questions and Answers for Campus interviews focuses on “Flux and MMF Phasors and Waves in Induction Motors”. 1. A three phase induction motor is not self starting. Explanation: A three phase induction motor is self starting. 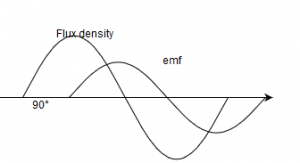 Because air gap flux and rotor mmf produce electromagnetic torque in the direction of rotating magnetic field. 2. 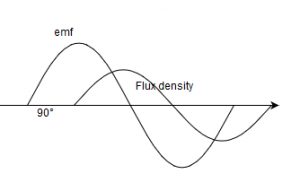 Mark the correct waveform for the emf produced in an induction motor and the resultant flux density wave for a resistive load. 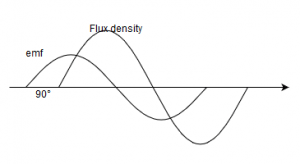 Explanation: The flux will lead the induced current and emf by 90°. 3. Mark the most appropriate phasor for the induction machine operation as motor. Explanation: The power factor angle is atan(x2/r2). 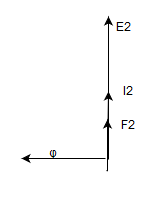 Explanation: The power factor angle would be atan(0.2/0.2) = 45°. 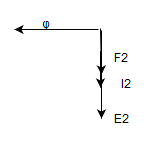 Explanation: Due to leakage reactance there will be a lagging of angle θ in the excitation voltage with the main flux. So the maximum is attained at 90°+θ. Explanation: In an induction motor, the stator is also known as field winding, and the rotor as armature winding. Explanation: For a squirrel-cage induction motor the rotor will have the induced poles will be same as flux density poles which are induced inside the machine while working. Explanation: External resistance can be inserted only in the wound rotor as does not get shorted as like squirrel cage motor. Explanation: Starting torque induced in a three phase induction motor depends on rotor mmf per pole and rotor power factor angle. 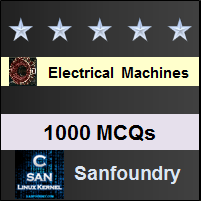 To practice all areas of Electrical Machines for Campus Interviews, here is complete set of 1000+ Multiple Choice Questions and Answers.